Speaker Donatille Mukabalisa (2nd right), Emmanuel Gasana (2nd left), Youth minister Rosemary Mbabazi (left) and Nyanza District Mayor Erasme Ntazinda clean remains of Genocide victims during Umuganda on Saturday. Courtesy. The grave is part of the district’s genocide memorial project which will also contain a genocide history museum. The grave which will cost over Rw325 million, is expected to be completed by April, and the burial will start in June, according to Erasme Ntazinda, the District Mayor. 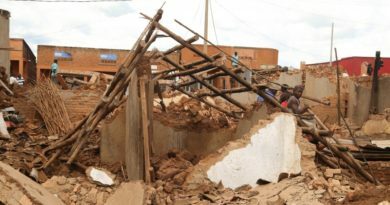 The remains will be relocated from five sectors namely Muyira, Ntyazo, Kibilizi, Busoro and Kigoma. However, he said that the second phase of the memorial which will consist of a history museum is estimated to cost Rwf150 million, but the district is yet get funds for its construction. 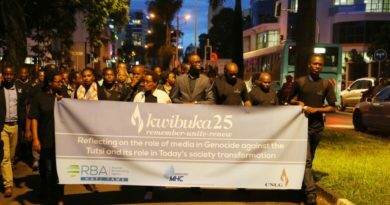 “The memorial will help preserve the facts of genocide, as well as explaining its history in the Mayaga region,” Ntazinda observed. During the monthly community service – Umuganda – on Saturday, Members of Parliament led by Speaker Donatille Mukabalisa, joined residents in Muyira Sector to retrieve remains of over 26,000 genocide victims buried there. The Speaker told Nyanza residents that all people have responsibility in building a country where all Rwandans live in harmony and enjoy welfare, and they should maintain joint efforts in commemoration activities as well giving decent burial to genocide victims. “There is a task that awaits us in many parts of this district where our people buried in an inappropriate manner should get a dignifying burial. This is an activity that will requires great commitment. We should continue to relocate the remains of our people from places which were not dignifying them, yet, we should restoring their dignity which they were deprived of when they were brutally killed. It would not give us pride to have their remains stay in an improper place. She thanked youth from the Association of student survivors of genocide (AERG) and Rwandan Graduates Genocide Survivors (GEARG) for participating in the burial activity which she said could recall the tragic moments experienced during the genocide. 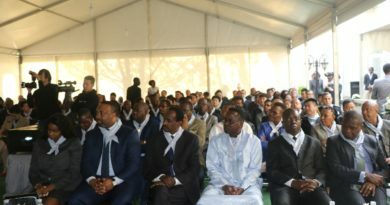 She urged Rwandans to commit to supporting vulnerable survivor groups especially the orphans and widows and cautioned residents to continue fighting genocide ideology as we mark Kwibuka25. “In a bid to prevent trauma cases, the orphans, widows, and people whose lost family members during the genocide against the Tutsi, they should be given special care. People should avoid anything that might cause such trauma, including offending words,” she said. She called for trauma counseling preparedness and concerted efforts so that any survivor who might be affected gets timely needed support.